…Okay, when is an injury ever expected? But anyway, can you believe that I’m already more than halfway into my Rock’n’Roll Seattle marathon training?! Month 3 was eventful, to say the least: you may remember me mentioning in my previous marathon training update that Rob and I were moving into a new house in a different neighborhood, so that alone brought so many new experiences. Bring on the new running routes – even though this area is just as hilly as our old ‘hood, if not hillier! Thankfully, the move was successful, and now we’re thoroughly enjoying living without landlords for the first time ever and making plans on what we’ll be doing with the house soon. Oh, and hoping that this darn injury takes care of itself soon. It better! 1. I’m glad to say that I was able to maintain my running and workout schedule during the packing-moving-unpacking time, even though it ate up all of my time and energy to do anything else, including blogging. I still need to get used to this new routine – driving a different route to work, going to a different gym, etc. – but I hope to eventually have it under control and devote more time to blogging in the evening. 2. I finally got a chance to try new running routes! I was getting so tired of my old route in our previous neighborhood because getting out for a run was demanding a serious mental effort. The new neighborhood has lots of streets and scenic roads, including a road that goes around a beautiful harbor, so there’s plenty of chance to switch things up if I feel like it. Also, there is a golf course in our neighborhood with paved paths – it’s superhilly and has a rule of ‘Golfers only between 8 am and 8 pm’, but I can always pretend that I don’t speak English if somebody starts bugging me while I’m out running :). 3. I finally tried running on trails! In case you didn’t know it, the trail running community in the Pacific Northwest runs strong. Up until recently I was only theoretically thinking of going to run after work some day in this wooded area called Putney Woods that’s very close to my work. It helps that the sun stays up in the sky much longer now, so the other day I finally bit the bullet and drove to one of the trailheads on a Friday evening after work. I had a 6-mile run scheduled, and spent well over an hour running by myself in the woods. That was quite a cathartic experience – the quiet sounds of birds chirping, the wind whispering up in the trees, and me paying attention to not step into multiple piles of horse poop on the trail 🙂 all provided a great chance to relax mentally and hit a nice runner’s high halfway through my run. Will I be going back? You bet, as long as it doesn’t rain a few days before so that the ground isn’t too muddy. Yes, I prefer my outdoors on the cleaner side, preferably with porta-potties and bathroom tissue when needed 🙂 . 1. Like I mentioned above, the time and effort we devoted to our move took out way too much wind out of my sails. I was glad that my plan to carve out time for exercise worked, but there was so little time to do anything else that I often skipped stretching and foam rolling after running just to have a chance to make dinner and unpack a few boxes. 2. Finding time for a good night’s sleep has once again proved to be a challenge. (Did you notice that I’m complaining about time-related things a lot?) On an average weeknight, I’m lucky to get 6.5 hours of sleep, which by Thursday-Friday builds up to me feeling like a zombie, yawning my face off as I drive to the gym after work. Add some demanding workouts to the mix, and it’s only logical that I’m not recovering all that well. 3. And now, for the BIGGGGEST DOWNNNN of them all… my weird left leg threw out another surprise for me in the form of an unexpected injury… Interestingly, this started way differently than any running injuries I’ve ever had. While usually something goes wrong during a run in less-than-perfect conditions (I was tired, the weather was bad and cold, etc. ), this time the trouble started last Saturday morning, on my rest day after a good night’s sleep. The lower part of my left shin started feeling like a tight string. I shrugged it off at that time, hoping that by Sunday morning – the day I had a 14-mile run scheduled – it would dissipate. Guess what happened on Sunday? Of course it didn’t get better. Silly me. Like any stubborn runner out there, I put on my brand new Brooks running shoes and went out for a run. The weather was perfect, a beautiful sunny morning after a rainy night, and it seemed like the day itself was pushing me to keep going. I felt great everywhere except for the darn left shin. It felt ok on all of the plentiful uphills my new neighborhood provides, but it sucked on the downhills. After some consideration (mostly mental yelling at myself that the world wasn’t going to crash down if I cut my run short) I turned around and ran back home. The run ended up at 5 miles instead of 14, but there was no way I could have done the full distance safely. – To up the mileage of my long runs, topping at 14 miles – the longest run was 12 miles, and it felt pretty good. The 14-miler didn’t happen as I’ve explained above. – To maintain my training routine as much as I can during moving – this was done successfully, even though my workouts may have made me pretty tired to do all of the packing/unpacking. My constant tiredness made for some really great (but short) sleep at night! – To incorporate 1-2 mile runs on strength training days – I’ve done a 1-mile running warm-up during my strength workouts about twice. This happened on days when the strength session was scheduled on a day after a rest day that followed a long run on Sunday (i.e. on Tuesdays). Can my descriptions get even nerdier?! – To figure out what I’ll be doing for nutrition on long runs – there’s been so much great advice about nutrition on-the-run from the readers of my blog in the comments to my previous training update (thank you so much everyone! ), but I have to admit that so far I‘ve only used gels for my long runs. About one gel has been consumed during runs of 10 miles or more, plus I’ve been putting one electrolyte tablet into my water bottle to make up for all the salt and other good stuff I lose with sweat. 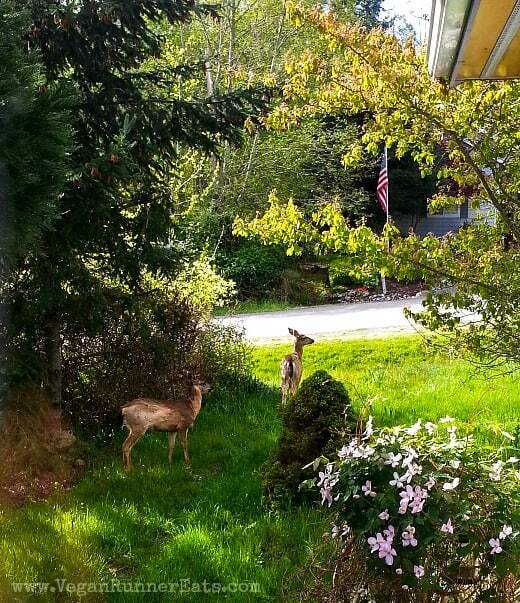 …but our new neighborhood has plenty of its own wildlife, like these deer strolling on our front lawn. Mondays – strength training at the gym or rest after the long run of the previous day. Tuesdays – rest or strength training at the gym. Wednesdays – treadmill interval running to total 6 miles. Thursdays – strength training at the gym. Fridays – running outside, 5-6 miles. Sundays – long run. This month, I had two long runs of just over 10 miles each, and one long run of 12 miles. Most of the training, except for the Sunday long run, has been happening in the early evening after work. Continuing the good tradition I’ve outlined in my previous post, I’ve been happily stuffing my face with any plant-based/vegan foods that I can get my hands on. In addition to breakfast, lunch and dinner, I usually fit in 3-4 snacks that go from a bagel with homemade vegan cream cheese (will be sharing soon!) as my second breakfast at work to apples, oranges and bananas later in the day. I try to eat a banana 1 – 1.5 hours before my afternoon workout so that not to arrive to the gym starving, and may have been noticed diving head-first into a jar of peanut butter upon returning home (okay, that may be getting too graphic for some of us!). I don’t eat anything during workouts or runs but drink plenty of water, and on long runs I’ve been eating one sports gel about an hour in. 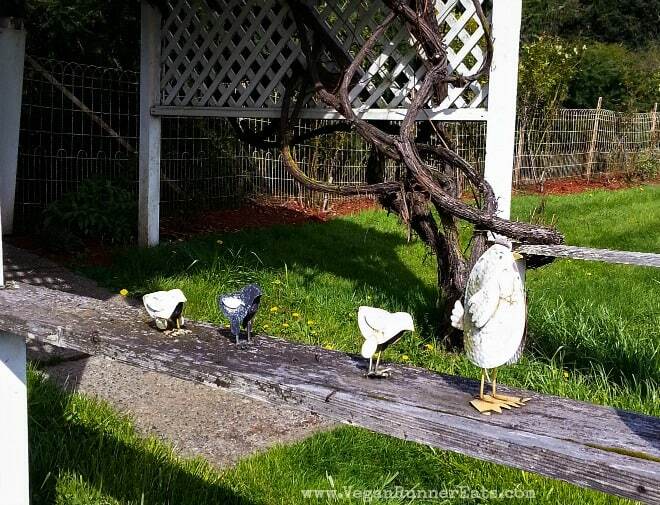 Let me just call this installation ‘Chicken Art with a Strong Message’ (seen in my new neighborhood). My strong message is something like ‘Keep your head up high’, but feel free to come up with your own! 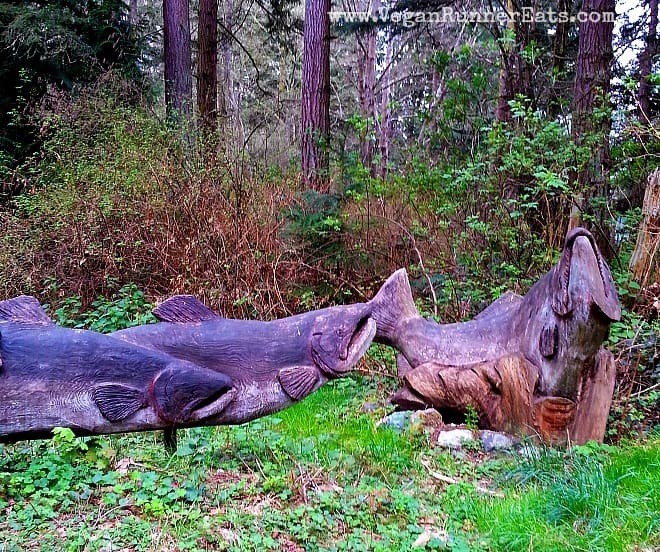 This salmon monument by the side of one of the local road is not a joke – each of the carved fish you see here is about as tall as I am! Imagine the size of the trees used to carve them out of! At this point, let me ask you a question: Have you ever gotten really excited about achieving some goal, but the time passed and you did some research, and all kinds of doubts started creeping in, so you eventually brushed that goal aside? Let me tell you: at any point in life I’m juggling at least a couple of those. Right now I have two of the absolutely amazing things on my mind that I could totally achieve if I put in the necessary effort – yet I keep coming up with the excuses for why it’s not the best time, or I’m not ready yet, or maybe I don’t have what it takes… What a bunch of BS! Let’s promise one thing to each other: let’s brush off all of those stupid excuses and GO FOR IT!!! Whatever it is that you’d LOVE to achieve, please make your first step, and then your second, and on and on until you’re there! In return, I’ll do my best to achieve those couple goals I have on my mind (I’ll share what they are in due time). Why now, you may ask? Because if not now, then when?! Nobody’s getting younger, and one day, hopefully many, many days from now, it would be so terrible if we had to look back at our lives and wish that we would have achieved more, done more, given more… There’s no day like today, so let’s do it! 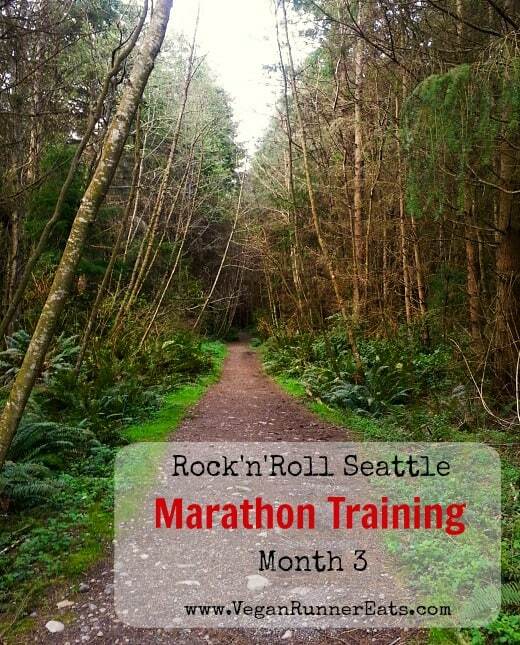 See all of the Seattle Rock’n’Roll marathon training updates over here. In case you’ve enjoyed this post, please share it with your friends or anyone who could benefit from it! And stick around for more awesomeness – you can follow Vegan Runner Eats by subscribing in the top right corner of this post, or by following the blog on Facebook, Twitter, Google+ and Instagram! Month 4 of Rock’n’Roll Seattle Marathon Training: the Finish Line is Getting Closer! Rock’n’Roll Seattle Marathon Training, Month 1: Preparing for Bigger Things to Come. Tagged injury, marathon training, Rock'n'Roll Seattle Marathon, running. Bookmark the permalink. I’m so happy to read you got to run in Putney Woods! My hubby and I loved running those trails. We actually made a trail map for the Seattle Orienteering club we belonged to. 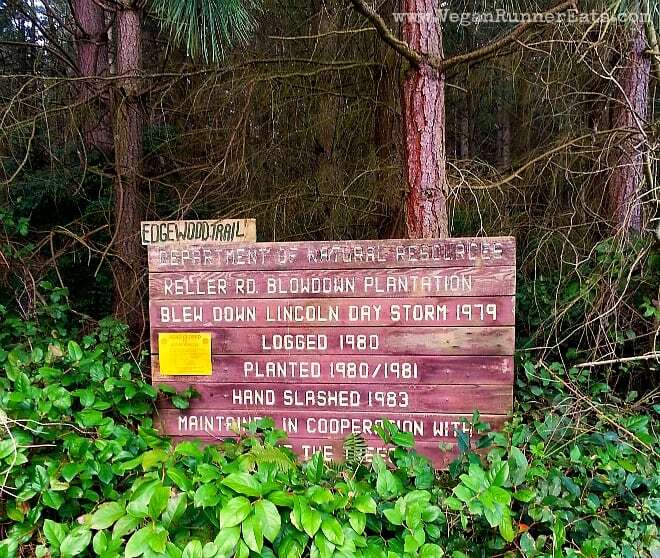 If you feel like exploring another set of great trails up near Coupeville, try Ft. Ebby State Park, and/or The Kettles. Wow, thanks Heidi! I’ve been wanting to run the Kettles trail for a while, hopefully after my shin gets better I’ll got here for one of my long runs! This post is so powerful, Alina. I just started training for my first marathon (August 23!!). 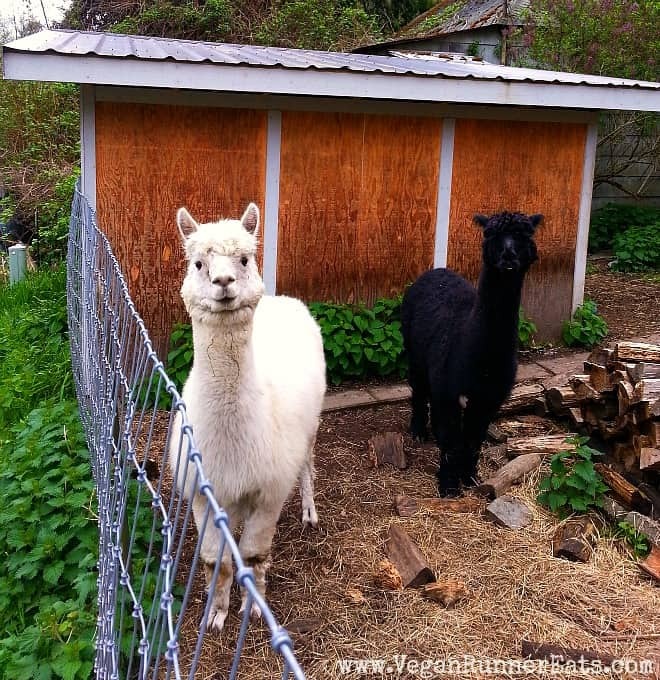 But sometimes, the more I think about it, worry takes over–can I do it? What if I’m injured? Etc etc. But you’re right — just Go For It. I’m going to try to make this my mantra. So glad to hear that my post has prompted a new mantra for you, Nicollette! Good luck in training for your first marathon! Where is it, by the way? What do you eat/drink for energy during your long runs? Trish, I’ve been eating one sports gel on runs that take over a hour, and popping one electrolyte tablet into my water bottle (GU brand sits well in my stomach). Also, check out readers’ comments to my previous month’s update, there are plenty of good ideas for all-natural fueling!